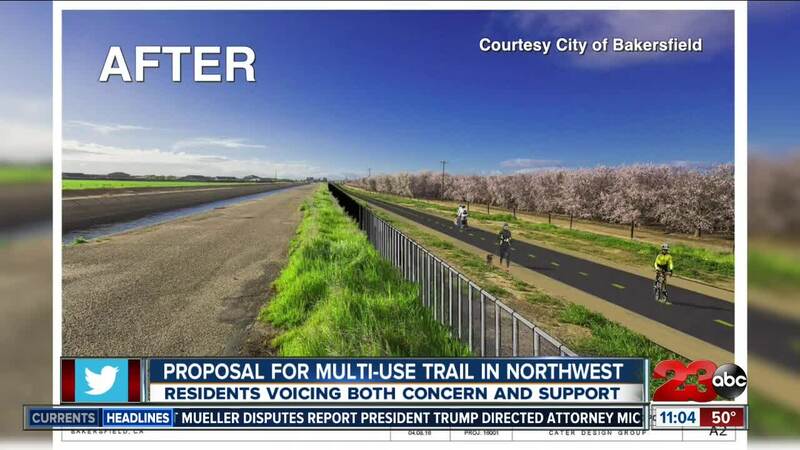 BAKERSFIELD, CALIF. — A proposal for a new trail in Northwest Bakersfield has community members and local businesses divided. City officials say this new trail is still a few years away from being completed but some community members are worried since the trail is expected to cut through the Links at Riverlakes golf course and surrounding areas. The City Council has obtained a permit to build on that property but is still securing funding. Leaders of the Links at Riverlakes Ranch golf course say they are concerned over safety and security for the golf course and surrounding homes that the trail cuts through. They say the planned trail crosses a bridge that connects part of the golf course to rest of the community. It is there where they say non-residents could enter the gated community. Community members see both pros and cons to creating the trail. “Some people could potentially be able to get into the neighborhood and onto the golf course that aren’t supposed to be but to some extent i think that those could be taken care of,” said Riverlakes resident, Ross Puskarich, 22. However, city officials say the location of the trail would make that difficult. “Well, there’s two canals. There’s the Friant-Kern Canal, and there’s the Calloway Canal and the trail is in between those two canals so it would be very difficult for anybody from the trail to access homes,” said Councilman Smith. Smith also says the trail will bring benefits. Residents will have a chance to voice any concerns at a planning commission meeting before construction actually begins. “I hope we can speak with people and work through their concerns and move forward with what is a wonderful new asset for the community,” said Councilman Smith. At this time no date has been set for that meeting but smith says it should occur in the next few months.